Are you or have you ever been a smoker? Two years after stopping, you’ll have a substantial decreased risk of stroke; five years later, your risk will be the same as if you never smoked. With serving sizes of a 12-oz. beer, a 6 oz. glass of wine or 1.5 oz. of spirits, 12 to 14 servings of alcohol a week is considered protective. Less is fine; more increases stroke risk. And are you addicted to caffeine? According to Minuk, 4-6 cups of coffee a day also protects against stroke. So have a slice or two of Boozy Banana Bread with a drink or two of booze followed by a cup or two of coffee, and stay healthy. Preheat the oven to 350°F. Melt coconut oil in a bowl of hot water. 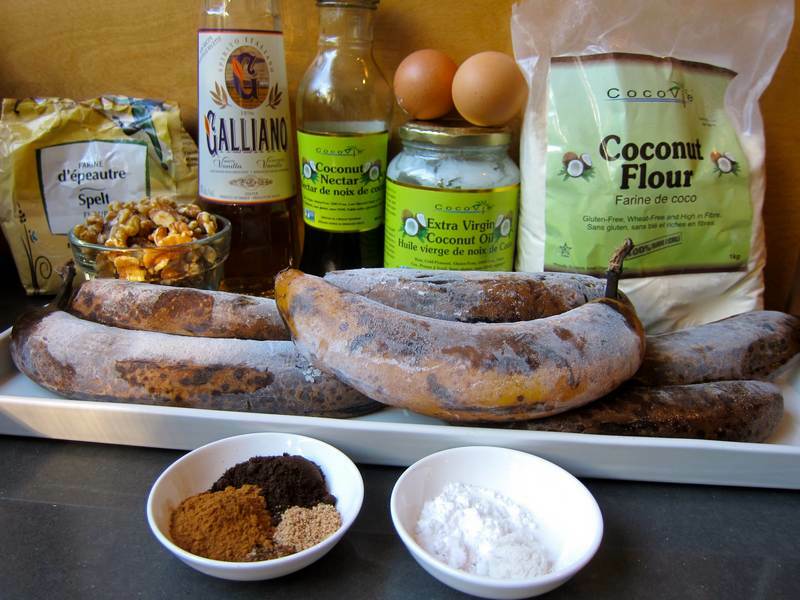 Mix coconut oil into the bananas in a large mixing bowl. Add nectar, egg, Galliano, vanilla, rum, cinnamon, cloves and nutmeg. Mix in baking soda and salt. Add the flour and mix. Mix in walnuts and chocolate chips. Pour mixture into a large coconut-oiled loaf pan. Bake for 50 minutes, or until a knife inserted into the bread comes out clean. Cool before serving. I wouldn’t have Galliano around at all if it wasn’t for Laura Winer‘s bright orange Harvey Wallbanger Cake recipe – which was delicious. Spirits seem to last forever. I wonder what else would taste good made with Galliano. Would you consider making one of these turkey recipes for American Thanksgiving? Marinated Grilled Turkey with Roasted Vegetables or Honey Ginger Turkey Breast with Roasted Asian Vegetables. Can you think of 14 high-fibre foods you should be eating everyday? CSSS Cavendish has a Smoking Cessation Centre. Speaking of stimulants, want to know what Dr. Sanjay Gupta has to say about weed? How many Jittery Cook banana bread recipes are there? Only three, including today’s. 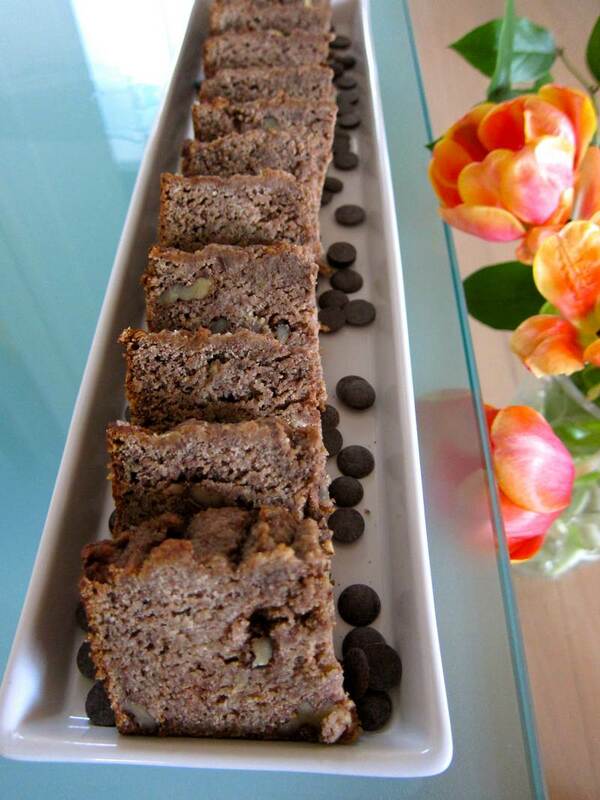 Have a look back at Chocolate Coconut Banana Bread and Banana Bread We Will Love! How interesting. That is much more than I would ever have thought! 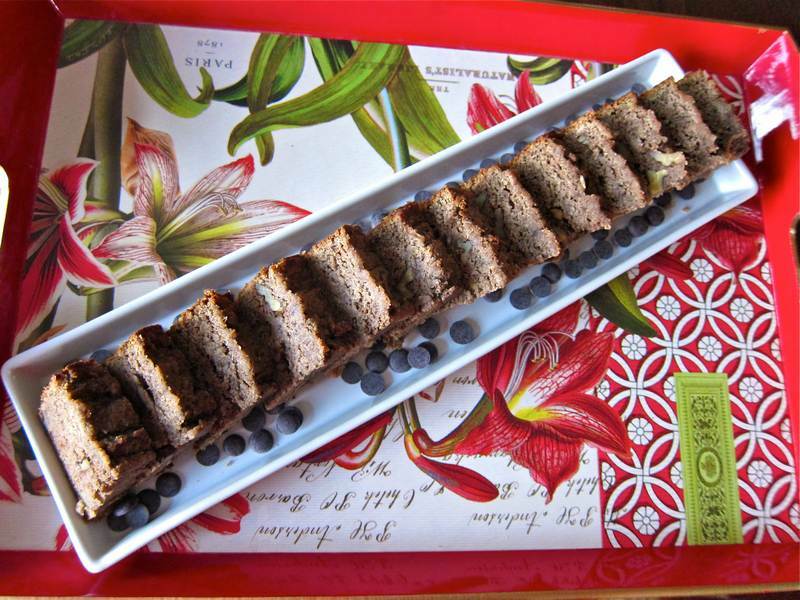 Banana bread is delicious, and I like your boozy version. A nice change from the traditional version. Thanks Darya! Let’s drink to that!! I try to find the recipe for frozen bananas unsuccessfully can you help me please? When you have a very ripe banana toss it into your freezer. When you are ready to bake, defrost them..